Mother Angeline McCrory is my Grandmother Mary Margaret McCrory’s first cousin. We grew up hearing the stories of this incredible lady, so I had always wanted to visit the Carmelite Sisters to learn more about her life and achievements that reflect so heavily through my family history. 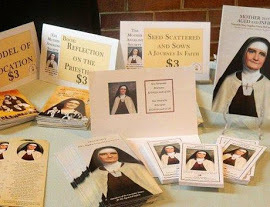 On an American road trip in June, we realized how close our route would take us to the Carmelite Sisters in Germantown and were thrilled to be able to stop and visit. On our arrival we were welcomed by Sister Patricia Margaret Rawdon. It was a real pleasure, as she had known Mother Angeline personally so could tell us all about the real person; her sense of humor, as well as her being strong and courageous. As we moved from room to room in the Motherhouse we started to build up a fantastic biography of Mother Angeline and her life story. Each part of the house was steeped in her history and values, and we were able to pause for a prayer in the chapel and visit the room in which she passed. A humbling moment for us both. We were both moved and inspired by her life story, incorporating tragedy and joy in equal measure and I was personally able to trace back my own family history through my Grandmother, Mary McCrory, and certainly pick out similar traits with my current family, which we had a good chuckle about. As such a strong woman in a male orientated world Mother Angeline’s achievements were truly remarkable and with our immediate family being so female weighted, our mother, 4 aunts, 3 sisters, 8 nieces, it’s been incredible to not only see such strength in my family but to also know where it came from. After a moving visit to her grave, we then had the pleasure of wandering through the impressive Mother Angeline Heritage Center. We were allowed access to a real treasure trove of artifacts, clippings and photos that reflected the hard work and passion Mother Angeline had for her life and work. The building has been thoughtfully and beautifully collated with a stunning portrait of Mother Angeline at the entrance. We were thrilled and also moved to discover the definitive history of her life drawn out in beautifully rendered pictures and text providing the visitor with a visual and emotional account of the inspiring life of Mother Angeline. After a quiet moment at Mother Angeline’s final resting place, we said our goodbyes and thanks for what was a truly enlightening experience. We both felt completely inspired and moved by the whole visit but not least, that this is a part of my family history of which I am immensely proud. It was easy to see why Mother Angeline chose this special place. We really fell in love with upstate New York and in particular the Catskills and look forward to keeping up communications with all of the Sisters and their hard work.